The waving of the arba minim/four species, also known as the etrog (a citron) and lulav (a bouquet of tree branches - palm, myrtle, and willow) continues to puzzle and baffle Jewish practitioners. Why gather these four? And what do we do with them? The Torah instructs us to collect them, but does not specify anything else. So the Sages instruct us to shake them toward the four compass points, the heavens and the earth. And why do we do this? All the explanations provided by Jewish tradition are hundreds of years older than the practice itself. It meant something different to our ancestors than it does to us. Very odd. Pagan holdover, say some. Aboriginal say I. The closest tie we have to our tribal past, excepting perhaps the body-modification practice of circumcision. 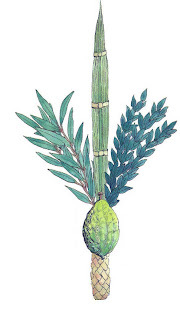 The most intuitive explanations of the lulav and etrog relate to water - a central theme of the Sukkot holiday. The rainy season in Israel begins around Sukkot. We initiate our annual prayers for rain at this time. There was a ceremony of "water drawing" performed in the Temple on Sukkot in which the altar and its surrounds were splashed with water. So applying this logic to the lulav, one realizes that dryness and moisture are denoted in each of the objects. The palm core is rather dry. The willow is a water-needy plant, and the willow branch of the lulav notably withers over the course of the week. The myrtle, by contrast, retains its fresh appearance. And the etrog is the ultimate fruity reservoir of moisture. Aside from water, the only notable feature of all four species is that they are all largely inedible. Water is the most meaningful marker associated with each. The Talmud Yerushalami hints at this when it comments "...they come as intercessors for water" (Taanit 1:1). Most striking of all, when the lulav is waved as prescribed, it's rustling makes a noise that sounds like rain, suggesting the waving ceremony was meant as a sympathetic ritual of power, inspiring the urge to rain in all parts of the earth, from the sky to the earth (filling wells, rivers, and lakes) - sort of the way the sound of running water can trigger the need to urinate. ....while directing it across the earth, again, has a strong theurgic logic to it. This too is a continuation our water theme, for, as the Bahir also teaches, The concept of water contains both male and female aspects...(Bahir 86). This notion of masculine (rain) and feminine (ground) waters that combine to fructify the earth occurs throughout traditional Jewish thought. And just to add to this, there is the holiday within a holiday, Hosanna Rabbah, which comes at the end of Sukkot. It features yet another ritual of obscure origins - hakafot (parading in circles) with willow branches. Often these are used to "whip" something, like the pulpit or readers table of the synagogue. Characterized by the sages as a "minor day of atonement," it might make sense to see it as a last appeal to God to send the rains promised to a faithful nation (Deut. 11). Can you say "rain dance?" "...Holidays such as Sukkot, the Feast of Tabernacles, provided symbols for visualization exercises, too. For example, visualizing he spine as Malkhut, in the form of the palm branch, and chanting Adonai, then visualizing the heart as Tiferet, in the form of the citron, and chanting YHVH, was one of the ways of binding heaven and earth..."
I discovered JMMM the other day; have read the most current post, and am intrigued. This stuff intrigues me so much that I ordered your book, and excitedly look forward to reading it. Part of my excitement arises from my interest in learning more about Judaism, but not knowing how to do so. I read the Old Testament less than two years ago, but learning what I did fell far short of what I want to know. Perhaps learning about Jewish myths, magic and mysticism will further my interest.